Have you been thinking about eye test Adelaide? Not sure if you have a problem with your eyes? One of the best things you can do for yourself is having an eye test. In fact, having an eye test is as crucial as making sure you have the right glasses. One of the benefits of carrying out this test is its ability to help you identify different eye health problems. Additionally, it can help you detect other body health issues you might not know you have. This include health issues like diabetes, glaucoma etc. The key with this type of test is making sure that it works for you. Fortunately, there are several ways to make this work for you. In this post, we’ll be looking at one proven method of making it work for you. What is it? Well, we’ll look at what is involved in a typical eye test Adelaide. This includes what tests to expect and what questions to ask your opticians. So without further ado let’s get straight to it. This test is usually done by an optician. Normally, he’ll access your eye health history to check for previous sight problems. Your general health is also very important. Hence, your optician might ask you about it. This is a type of eye check-up that involves the process of determining how strong your glasses are. In case you are wondering, this is usually done by opticians. They do this so as to tell if there is a change in your prescription or not. When going to such a test, keep in mind that your optician will ask you several questions. This includes handing over your specs to them. These they do to test your specs on special equipment. All this happens in the pre-testing phase, yes before your appointment with your optician. This is a test for glaucoma. A plus about this particular check-up is that it is very easy to spot. If you were to Visit an Optometrist, your trip will be very short. What they normally do is very simple. A good number of them basically use a method that involves blowing puffs of air into your eye. This is what helps them detect any problems. This is a check-up that involves looking at your peripheral vision. The good thing about this is that your optician is not the only one who can perform it. In fact, you can have a technician do it for you before making an official appointment. In term of what it involves, you’ll be asked to click on a button once you spot dots of light flashing in the edge of your vision. This type of check-up typically involves the process of determining which specs are best for you. For this to happen properly there’ll be an appointment set up between you and your optician. During this appointment, he/she will show you a series of eye lenses while asking you a variety of questions. These questions are of importance as they help them determine the state of your eye. Chances are high that you’ve seen this type of eye-test before you just didn’t know what it was. So what is it? Well, Autorefraction is a type of check-up done to estimate the type of your prescription. 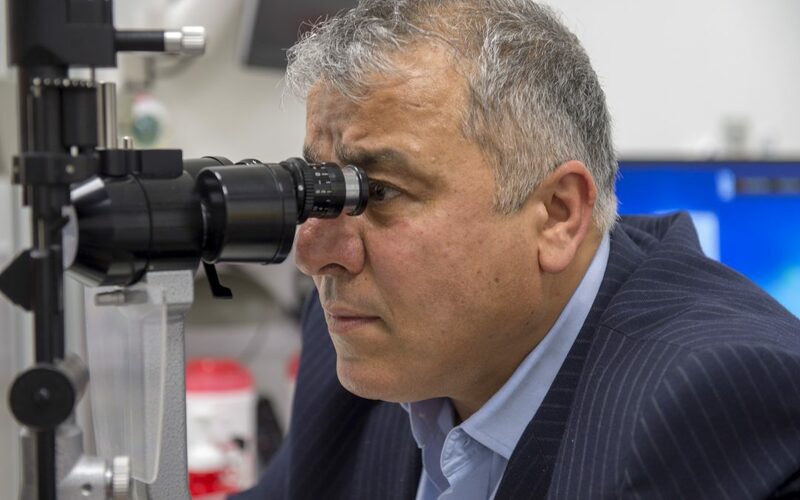 A typical appointment usually involves an optician asking one to look into a specialised machine. This machine usually has moving pictures in and out of focus. This test involves the use of a microscope together with a bright light. In such a check-up, opticians use this two to look at the front and back of your eyes. of importance to note is that there’ll be a chinrest during your visit. This you’ll use to place your chin during the check-up. Arguably one of the most complicated tests in this list, an Ophthalmoscopy involves the process of looking inside one’s eye. In particular, this helps in looking at one’s retina. Typical Ophthalmoscopy check-up involves the use of deem lights. Once this is a done your dentist comes with a light and uses it to check on your eyes in different positions. Have eye problems? Want to schedule an eye test Adelaide appointment? Get in touch with us via phone by dialling 08 8285 7100 or 0433 510695. Our experienced support team are always willing and happy to assist.